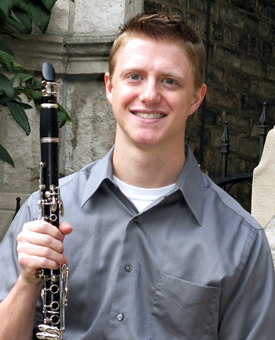 Brian Gnojek is a freelance clarinetist and teacher in Austin, Texas. Brian has performed as a substitute musician with the Houston, Fort Worth, Kansas City, New World, San Antonio, and Wichita Symphony orchestras. From 2010-2012, he held a position as a member of the Civic Orchestra of Chicago, where he performed under the baton of guest conductors such as Riccardo Muti, Esa-Pekka Salonen, and Jaap van Zweden. In 2010, Mr. Gnojek was selected by unanimous vote as the winner of the Orchestral Audition Competition held by the International Clarinet Association. He has performed as a member of the Banff Festival Orchestra, and has also participated in the National Orchestral Institute and Sarasota Music Festival. Mr. Gnojek has performed as a solo and chamber artist in the Austin, Kansas City, Chicago, and New York City areas, including recitals as a guest artist at the University of Kansas. During his studies in the Manhattan School of Music’s orchestral performance program, Brian performed under world-famous conductors and at such venues as Carnegie Hall, Alice Tully Hall, and the Kennedy Center. An enthusiast of classical and jazz styles, Brian has studied jazz improvisation with William Kennedy and Eddie Daniels. Brian studied the process of transcribing and analyzing jazz solos, writing a thesis while at Florida State University entitled “An Analysis of Improvised Jazz Solos of Eddie Daniels Through Transcription and Analysis.” Brian spent two years as a member of the Agitato jazz trio with the unique instrumentation of clarinet, cello, and guitar. Brian’s favorite jazz artists include Maria Schneider, Eddie Daniels, Charlie Parker, Oscar Peterson, Michael Brecker, and Béla Fleck. Brian is passionate about musical outreach, within his own communities and internationally. Mr. Gnojek is a founding member of the Trade Winds Ensemble, who traveled to Nairobi, Kenya in the summer of 2013, and again to Nairobi and Arusha, Tanzania in 2016. The group has worked with youth orchestras and schools, including a two-week residency teaching general music in Kawangware, one of Nairobi’s slums. Their performances included interactive educational concerts, a solo performance of the Mozart Sinfonia Concertante with the Nairobi Orchestra, and even a short performance for a Maasai village in Amboseli National Park. In 2017, the Trade Winds Ensemble taught in Chiago, Illinois at the People’s Music School, and RefugeeOne, a refugee resettlement agency. Brian has also volunteered in the Philippines and southern India as a volunteer with Artists Striving to End Poverty (ASTEP). Brian has taught privately for much of his career, from beginning students to masterclasses at the university level. He has taught students from age ten to forty, and enjoys the challenge, and reward, of finding the right way to explain concepts to each individual student. Brian loves cooking, and is attempting to cook a meal from every country in the world. He also loves traveling, whether to the Pyramids of Giza halfway around the world, or to the World’s Largest Catsup Bottle in Collinsville, Illinois. Brian earned a Professional Studies Certificate in Orchestral Performance at the Manhattan School of Music in 2014. He holds a Bachelor of Music degree in clarinet performance from Florida State University, and a Master of Music degree from the University of Minnesota. His principal teachers are Mark Nuccio, Burt Hara, Frank Kowalsky, and Fred Ormand. Mr. Gnojek is currently living, teaching, and freelancing in Austin, Texas, with several performances and collaborations on the horizon. If you are interested in taking lessons with, hiring, or collaborating with Mr. Gnojek, please contact him via the e-mail address or phone number listed below. New Clarinet? Read This First!